A watershed extending from Anchorage to the Gulf of Alaska, the Cook Inlet encompasses 180 miles (290 km) of beauty and recreation. It’s surrounded by mountains, waterfalls, glaciers and volcanoes, including the active Augustine Volcano and Mount Redoubt, linking the area with tsunamis and earthquakes in the past. The Upper Cook Inlet is also one of few places in the world that experiences a tidal bore, allowing visitors to see the unusual phenomenon of waves crashing against the current rather than with it. The Cook Inlet also holds much history, from Russian fur hunters to European explorers like Captain James Cook—after whom the site is named—visiting and mapping out the area as they tried to find the Northwest Passage in 1778. Around Upper Cook Inlet were Native Alaskans from eight different villages, with some descendants of these families still living there today. Along with its beauty and heritage, the area offers a wide range of experiences. Popular flightseeing excursions allow for dramatic aerial views of the Alaskan landscape, while charter boats offer salmon and halibut fishing trips. For a unique wildlife experience, there are occasional sightings of the Cook Inlet beluga whale, an endangered subspecies of beluga whale. Drive along the Turnagain Arm and you’ll have chances to see these whales as well as dall sheep, bears and bald eagles. Insider tip: The Cook Inlet is a beautiful spot to take in at sunrise or sunset, especially with a view of 4,396-foot Mount Susitna, also known as the “Sleeping Lady,” shrouded in bright colors. Spring through fall is the best time to visit the Cook Inlet, as this is your best chance at seeing whales from the Turnagain Arm. Captain Cook State Park is another great Cook Inlet spot to look for both whales and birds. Meet the animals of Alaska on a 4-hour tour from Anchorage. 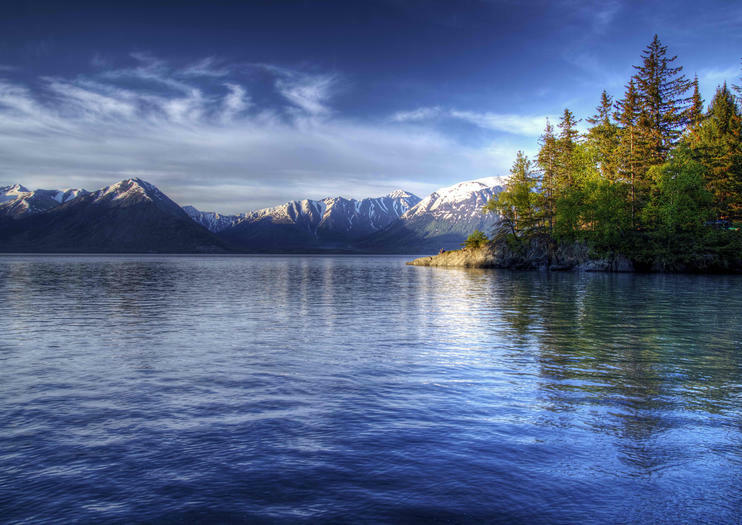 Travel down the gorgeous Seward Parkway along the Turnagain Arm waterway to viewpoints including the Anchorage Coastal Wildlife Refuge, Bird Point and Beluga Point. Take in the breathtaking scenery and look for wildlife, then continue to the Alaska Wildlife Conservation Center, situated at the edge of Portage Valley. Go inside the sprawling nature preserve for injured animals to view large land animals up close. You can see critters such as fox, lynx, grizzly bear, caribou, wood bison and more. Explore a coastal trail along Cook Inlet on this 2-hour Anchorage cycling tour on a fat-tire bike. Following a guide, you'll enjoy views of the water, Alaska Range, and Denali as you ride from downtown to Earthquake Park. Select a morning, afternoon, or evening departure time when booking.